The spectral type classification scheme for stars is, among other things, a temperature sequence. A helpful mnemonic for remembering the sequence is Oh, Be A Fine Girl (Guy) Kiss Me Like This, Yes! The O stars have the highest surface temperatures, up to 56,000 K (100,000° F), while the Y infrared dwarfs (brown dwarfs) have surface temperatures as cool as 250 K (-10° F). Here are the brightest representatives of each of these spectra classes readily visible from the northern hemisphere. Apparent visual magnitude (V-band) is given unless otherwise noted. There is a supermassive binary star in our own Milky Way Galaxy that has the potential to create a super-supernova (hypernova?). It could go off tomorrow—or a million years from now. The star system’s name is Eta Carinae. Currently 4th-magnitude and located some 7,500 ly away in the direction of the southern constellation Carina (“The Keel”), Eta Carinae consists of a 100-200 M☉ star and a 30-80 M☉ star in a highly-eccentric 5.54y orbit with the more massive star undergoing prodigious mass loss. Eta Carinae never rises above the horizon unless you’re south of latitude 30° N. So, if Eta Carina ever does go supernova while humans still walk the Earth, you’ll have to travel at least as far as southern Texas or southern Florida to see it. And it will be an impressive sight, easily visible during the daylight hours. Closer to home, there are seven prime candidates for the next relatively nearby supernova. The nearest of these currently is IK Peg. Keep in mind that over hundreds of thousands of years, stars move quite a lot, so what is close to us now will not necessarily be close to us when a supernova event finally does occur. IK Pegasi, a binary system comprised of a white dwarf already near the Chandrasekhar limit, and a close-by soon-to-be-giant main-sequence star, lies just 147 to 155 ly away in the direction of the constellation Pegasus, the Winged Horse. IK Peg appears to us visually as a 6th magnitude star located roughly ⅓ of the way from Delphinus to the Square of Pegasus. As the giant star expands into the vicinity of the white dwarf, the white dwarf will accumulate enough material to put it over the Chandrasekhar limit, and a Type Ia supernova will ensue. Spica (α Vir), located at a distance between 237 and 264 ly, is a massive binary system (10 M☉ and 7M☉), with the two stars orbiting each other every four days. Alpha Lupi (α Lup) is a massive star (~10 M☉) located between 454 and 476 ly from our solar system. Betelgeuse (α Ori) is a massive star (~12 M☉) between 500 and 900 ly away. Incidentally, there is a lot of uncertainty about the distance to Betelgeuse, primarily because it’s angular size (44 mas) is an order of magnitude larger than its parallax (4.5 mas) (Harper et al. 2017). Rigel (β Ori) is a massive star (~23 M☉) between 792 and 948 ly distant. Gamma2 Velorum (γ2 Vel) is a binary system 1,013 to 1,245 ly distant containing two stars which will go supernova in the not-too-distant future. The system consists of a 28.5 M☉ O7.5 giant star and a 9.0 M☉ Wolf-Rayet star (the nearest, incidentally) orbiting each other every 78.5 days. The Wolf-Rayet star will be the first to supernova, followed later by the O giant star. Tomorrow—or a million years from now? We have no way of accurately predicting. But rest assured, in the unlikely event that any one of these stars goes supernova during our lifetimes, none will be close enough to harm us. Instead, for a time, we will be treated to a object comparable to the Moon in brightness and visible both day and night. The sixth largest constellation in the sky stretches from near Rigel on the west side of Orion down to 1st-magnitude lucida Achernar (declination -57°), a star that rotates so rapidly that its polar diameter is not even ¾ its equatorial diameter (Domiciano de Souza et al. 2014). 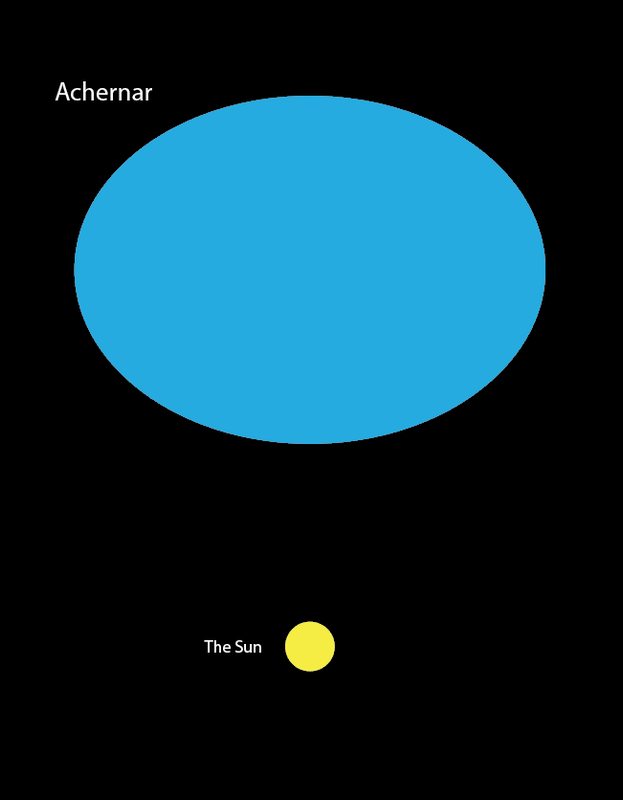 Achernar (α Eri) is appropriately named. It means “The End of the River” in Arabic. Eridanus, the River, contains two very special, easily seen, stars. 40 Eridani (also known as Keid and Omicron2 Eridani), a visual triple star system (magnitudes 4.4, 9.5, and 11.2) just 16.3 light years away, presents the most easily observed white dwarf star, 9.5-magnitude 40 Eri B, visible in any telescope. A little further west we can find 3.7-magnitude Epsilon Eridani, the nearest star beyond the Alpha Centauri system thought to harbor one or more planets. Compared to our Sun, ε Eri is cooler (K2V), much younger (200-800 Myr), and somewhat metal-deficient (74% solar), and it is just 10.5 light years away. This youthful star still sports a dusty disk between radii 35 and 75 AU (Greaves et al. 1998), inside of which its putative planet, Epsilon Eridani b—at least 0.6 to 0.9 Jupiter masses—travels around the star in a highly elliptical orbit, completing one revolution every 6.85 to 7.26 years. At periastron, Epsilon Eridani b lies between 1.0 and 2.1 AU from its parent star, and at apastron, its distance is 4.9 to 5.8 AU (Mizuki et al. 2016). However, the existence of this or any other planets in the system is still far from certain, primarily due to the high level of photospheric activity that is difficult to disentangle from the radial velocity signals of any possible orbiting planets (Giguere et al. 2016).